How Involved were the Students? Viewing a beautifully shaped tree is to me a joyous experience. 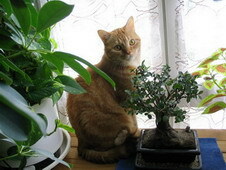 Maybe that is why I find the art of creating a bonsai so fascinating. Since I started looking at bonsais, I find myself searching for the perfectly shaped or most interesting trees; and imagining how it would look in a pot. One year I decided to have my biology students use local flora to create a bonsai. I assembled wire, old dishes and pots, rocks and gravel, potting soil, fertilizer, scissors, clippers, instruction books, instruction worksheets and picture books. Imagine this tree as a fabulous bonsai. Some students got really excited about the art of shaping the trees. Students studied the branches, leaflets, and buds closely, knowing that shaping the stems and maintaining the plant depended on this observation. They developed a vocabulary for speaking about the anatomy of plants. They planned ahead, developing critical thinking skills. They made mistakes, learned that knowledge is important, and that projects can still be completed--the benefits of all hands-on learning. Also, those that were not overly concerned with learning biology for biology's sake found a reason to be involved, to look up information, and to create art. Pruning bonsai is an art, as is wiring the stem to force a shape. Both require imaginative visualization, planning, and patient work towards a goal. 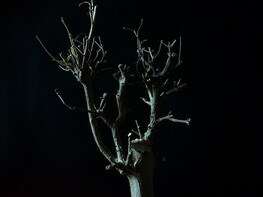 The unique shapes of bonsais are produced by careful pruning and wiring. Students will learn to recognize buds and new growth as they prune their bonsai. The artist in each student will emerge as students try to make pleasing shapes. © 2005, 2014; All rights reserved. Last modified 5/7/14.